Rudolf Steiner spoke the Foundation Stone meditation at the Christmas Conference of the General Anthroposophical Society in 1923, giving it to the Society's members for the strengthening of their forces. The meditation's words contain, to quote Sergei O. Prokofieff, "the quintessence of the whole of anthroposophy". Thus, Steiner was bestowing on the members the potential to deal resolutely with the specific tasks awaiting them. 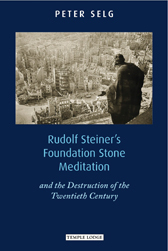 In this short but potent volume, Peter Selg suggests further that the Foundation Stone meditation represents the concerns of every individual of the modern age, allowing each of us to maintain our humanity in the face of the challenges and catastrophes of the present and future. Rudolf Steiner said that one could hear the words of the meditation "sounding" in one's heart. This process of "hearing" will acquire even more significance and reality in future, and can be of enormous help to anyone who opens themselves to it. It is against this background that Selg has written this introductory book: to promote awareness of the meditation, understanding of its historic place in the catastrophic twentieth century, and its critical but latent contribution to the future. PETER SELG was born in 1963 in Stuttgart and studied medicine in Witten-Herdecke, Zurich, and Berlin. Until 2000, he worked as head physician of the juvenile psychiatry department of Herdecke hospital in Germany. Dr Selg is now director of the Ita Wegman Institute for Basic Research into Anthroposophy (Arlesheim, Switzerland) and professor of medicine at the Alanus University of Arts and Social Sciences (Germany). He lectures extensively and is the author of numerous books, including The Figure of Christ, The Agriculture Course and Rudolf Steiner and Christian Rosenkreutz. He is married with five children.